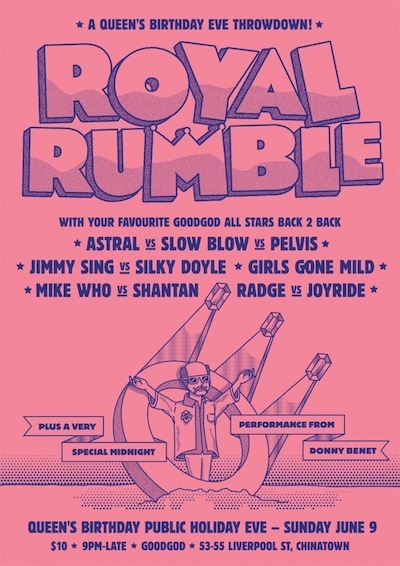 In true Goodgod public holiday eve tradition, we’re bringing the heavyweights together for ROYAL RUMBLE, a regal full-venue party ragin’ all the way into the Queen’s Birthday. Taking over the Danceteria is a triple-threat showdown between three of our fave DJ crews… evergreen Sydney favourites ASTRAL DJs, proven party starters SLOW BLOW, and unflappable rhythm connoisseurs PELVIS. In the front bar, we go head-to-head with back-to-back sets from Mike Who & Shantan, Radge & Joyride, Jimmy Sing & Silky Doyle and Girls Gone Mild. And to cap it all off, scholar of smoothness Donny Benet is bringing the midnight touch with a very special late night live set. Don’t miss our last public holiday eve party for a while! It’s goin’ down from 9pm til very, very late.